[AUGUSTA, GA – March 9, 2018]- Artwork by local artist Colleen Beyer Stewart is now on display at the Chamber of Commerce Gallery, located in the offices of the Augusta Metro Chamber of Commerce. 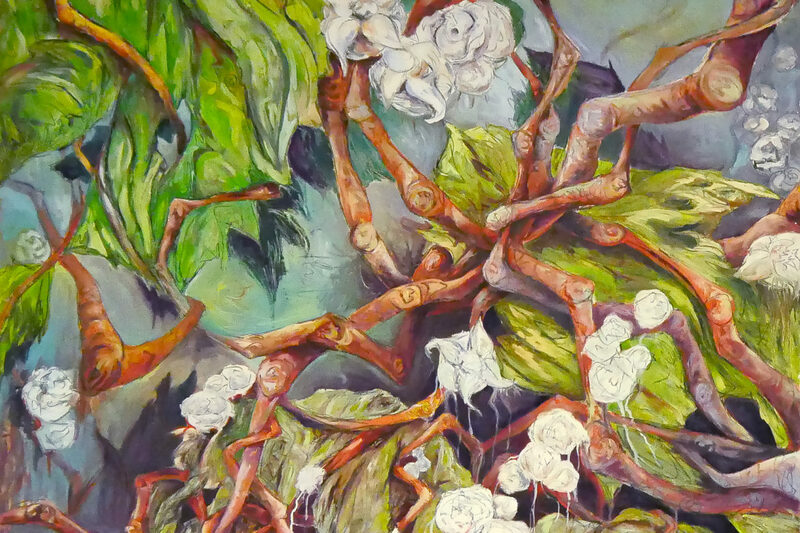 The show, titled “Entangled” features works Beyer produced as part of her MFA thesis project, which references natural forms, twisted tree branches and floral elements. The show will remain in the gallery until July, and all artwork is for sale. The offices of the Augusta Metro Chamber of Commerce are located at 1 Tenth Street, Suite #120. Chamber Gallery hours are Monday-Thursday 8:30-5, Fridays 9-3. For purchasing information, contact gallery coordinator Christina Berkshire, Christina@augustaarts.com or 706-826-4702. From colleenbeyerstewart.com – Colleen received a Bachelor of Arts in Studio Art from the University of West Georgia and a Master of Fine Arts from Georgia Southern University. Colleen now resides in Augusta, Georgia. She is the visual arts teacher at Harlem High School. Her work is influenced by nature, botanical forms and mark-making. The mid 20th century painter Philip Guston once stated that it is “the nakedness of drawing” to which he is attracted. Colleen also enjoys the “nakedness” of drawing, the raw marks and lines used to describe forms. Each piece begins as a charcoal drawing. She then builds layers of oil paint and carves back into them with her charcoal pencil.